Anthony "Rumble" Johnson has been fighting at 170 pounds, and is one of the biggest guys in the welterweight division. Recently, however, the UFC offered him a fight with Vitor Belfort at 185 pounds and Johnson jumped on it. He'll move up a weight class and, depending on how well he performs against Belfort, might just stay there and make a run at Anderson Silva's title. In this video, Rumble talks about moving up in weight to fight Vitor at UFC 142 in Brazil. Rich Franklin continues to rehab his injured shoulder and is looking to return to the Octagon next year. In this video, he gernously interrupts his reading of Good Housekeeping magazine to share his rehab exercises with the world. Afterwards Rich continues his quest to ride 22 miles on a bike in one hour. He's done 11 miles in 30 minutes, but that 22 mile mark has proven to be, like Lyoto Machida, very elusive. Will he do it? Find out in this video. Joe Rogan and Eddie Bravo are two of MMA's biggest proponents of marijuana use. They say it helps improve not only their jiu-jitsu games, but their lives as well. They make no apologies for smoking bud and go out of their way to advocate it's use. Not that there's anything wrong with that. Of all the drugs that are illegal, marijuana is not only the least harmful, it is actually beneficial in many ways. Which is why many states now allow marijuana to be prescribed by doctors. In this video, Eddie and Joe state their case on why people should stop fretting over pot smokers. Basically they are saying, like, chill dude. In a surreal YouTube moment, Dana White's mother, June White, posted a video where she was interviewed by Dana's arch-enemy Jerry Millen. Millen spoke with Mrs. White about the changes she's seen in her son since he hit the big time, including the physical changes in his physique which, in June White's opinion, are the result of steroid use. The video was on YouTube for several hours, but then disappeared due to Zuffa claiming copyright ownership. That claim is bogus of course, because Zuffa does not own people's opinions--not yet anyway, but they're working on it! Fortunately, the video has resurfaced on YouTube and I have posted it here. Mrs. White has been getting blasted by fans of the "Baldfather" and people have been saying unspeakably horrible things about her. I'm not sure how Dana could let his mom take that kind of abuse--she is his mother, after all. The video is a follow up to her tell-all book called Dana White: King of MMA. 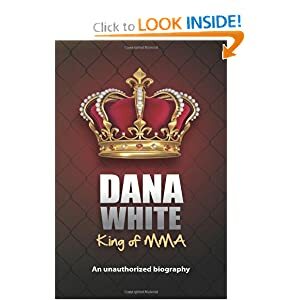 It is a brutally honest look at the transformation of Dana White, as seen by the one person who was there from the very beginning. The book is available at Amazon.com. Here's the forbidden video interview with Jerry Millen and June White. For UFC HW champion Tim Sylvia is still a student of the game. Known for his striking, Tim has been working hard on his ground game and all that training has paid off. Check out this video of Tim getting spanked with belts by his training partners after receiving his purple belt in BJJ. The beating is not too bad, because the guys were told to hit him, but "not the face and not the balls." So he'll be fine for his fight tonight on the ProElite card, which will be televised by HDNet. Jake Ellenberger is not a fan of Nick Diaz. In this video interview he says that he dislikes Nick and wants to smash him. He also talks about a possible rematch with Carlos Condit, who beat him by split decision in their first fight in 2009. Condit is odd man out right now, after Nick Diaz moved up to the number 1 contender slot after beating BJ Penn. Condit was supposed to fight GSP for the title as the main event of UFC 137, but GSP had to pull out of that fight after a knee injury. Carlos elected to wait for GSP to heal up, but Dana White decided that Nick Diaz would get the title fight first, leaving Condit in a lurch with no one to fight right now. Ellenberger is hoping to avenge his loss to Carlos in a rematch. That would be an excellent fight and hopefully UFC matchmaker Joe Silva puts this one together. Jake Ellenberger is not a fan of Nick Diaz. In this video interview he says that he dislikes Nick and wants to smash him. He also talks about a possible rematch with Carlos Condit, who beat him by split decision in their first fight in 2009. Alistair Overeem was at the Holland premier of Warrior, the MMA film. He said it was an excellent film and then went on to talk about his upcoming fight with Brock Lesnar in December. Overeem is very confident going into this fight and is already predicting a "knockout victory in the first round." The interviewer asked Overeem about his training for the fight, but Overeem refused to reveal anything about it. But you can be sure that it involves horse meat. Because Alistair Overeem cycles horse meat. Here's the video interview with Alistair's bold prediction. Junior Dos Santos, who takes on UFC HW champ Cain Velasquez on Fox TV on November 12, says he's training hard on his wrestling in preparation for Cain. Velasquez is an elite wrestler, and Dos Santos knows that no matter how hard he trains in wrestling, Velasquez will have an advantage there. However, he feels that his BJJ will negate Cain's wrestling and that's he better on the feet than the champ. Time will tell. This fight is clearly a battle between the two best heavyweights on the planet (although Alistair Overeem may disagree) and it should be war. Rampage Jackson: I'm a be in Jon Jones's Grill!